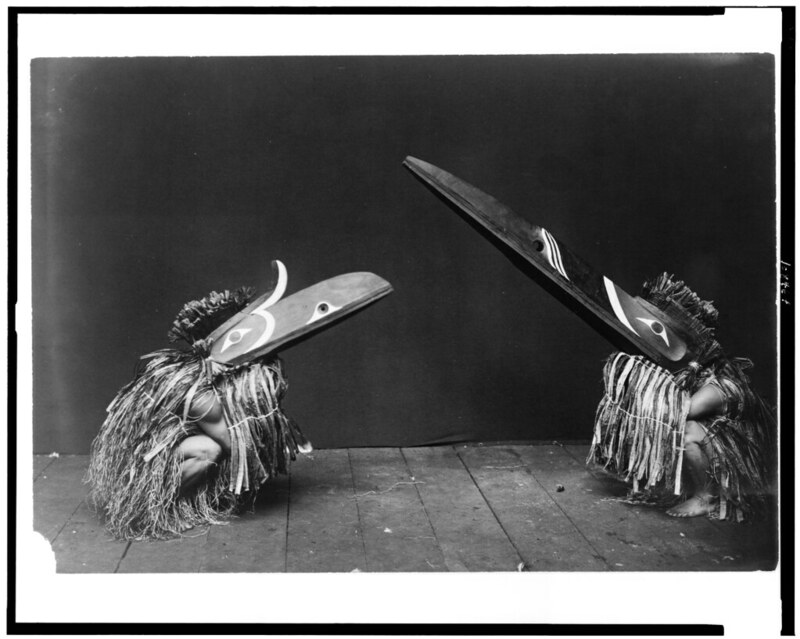 Kotsuis and Hohhug, Nakoaktok — Nakoaktok men in ceremonial dress, with long beaks, crouching on their haunches. 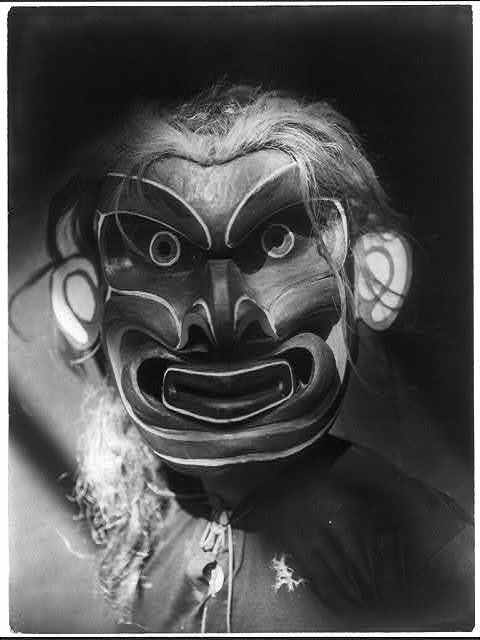 The Kwakwa̱ka̱’wakw (or Kwakiutl) are an indigenous people of the Pacific Northwest Coast, covering the territory of British Columbia on northern Vancouver Island and the adjoining mainland, and on islands around Johnstone Strait and Queen Charlotte Strait. United by the common language of Kwak’wala, the broad group can be divided into 13 nations, each with its own clan structure and distinct histories. 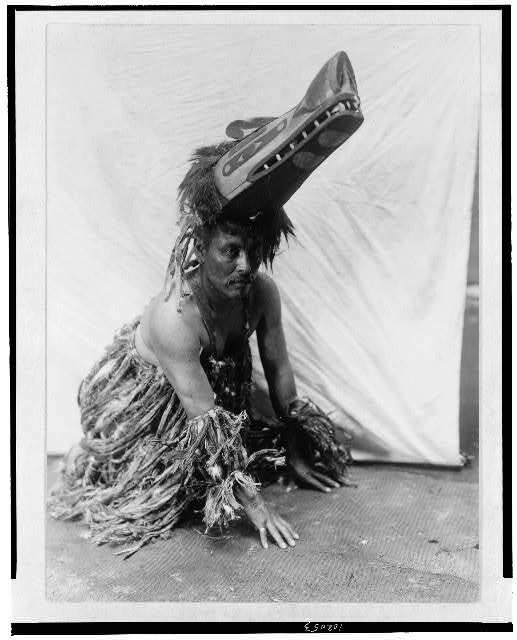 According to Kwakwaka’wakw folklore their ancestors (‘na’mima) came to a given spot — by way of land, sea, or underground — in the form of ancestral animals that upon arrival shed their animal appearance and became human. The first documented contact with Westerners was in 1792 during the expedition led by English officer Captain George Vancouver, and was soon followed by colonies of Europeans settling on Canada’s West Coast. As was often the way, with settlers came disease and the Kwakwaka’wakw population dropped by up to 75% between 1830 and 1880. Their distinctive ideas about wealth — that status came not from how much you owned but how much you were able to give away — came to the particular attention of the US anthropologist Franz Boas, who wrote extensively on their elaborate gift-giving ceremonies known as “potlach”. The ceremonial practice was also a particular target of Christian missionaries who saw it as a major obstacle to their “civilising” mission, and the Canadian government banned the practise in 1885 (although the act was soon amended, proving impossible to enforce). 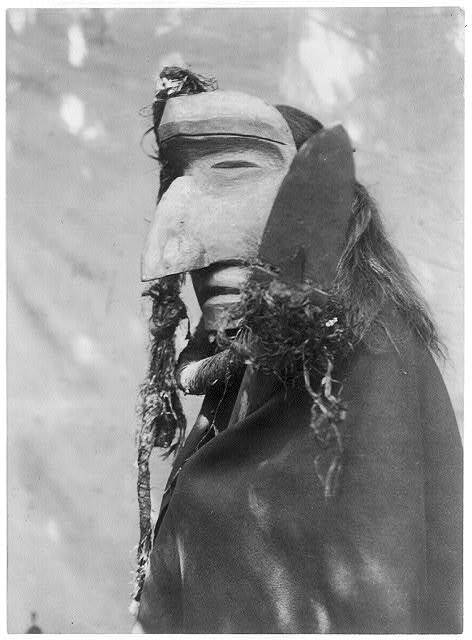 The photographs of the ceremonial dress and masks of the Kwakwaka’wakw presented here are the creation of American photographer and ethnologist Edward Curtis (1868–1952), famous for his work with Native American people. Part of a project funded by banking magnate J.P. Morgan, these photographs are from the collection held at the Library of Congress, and contain many images not published in Curtis’ enormous twenty-volume The North American Indian. In 2015, Taschen produced their epic 768-page The North American Indian: The Complete Portfolios, which gathers Curtis’ entire American Indian portfolio into one publication. Hami, Koskimo — Koskimo person wearing full-body fur garment, oversized gloves and mask of Hami (“dangerous thing”) during the numhlim ceremony. 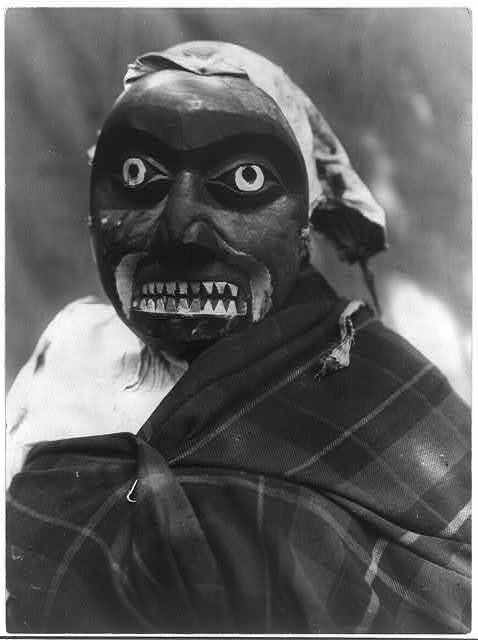 Tsunukwalahl, Qagyuhl — Person wearing Mask of Tsunukwalahl, a mythical being, used during the Winter Dance. 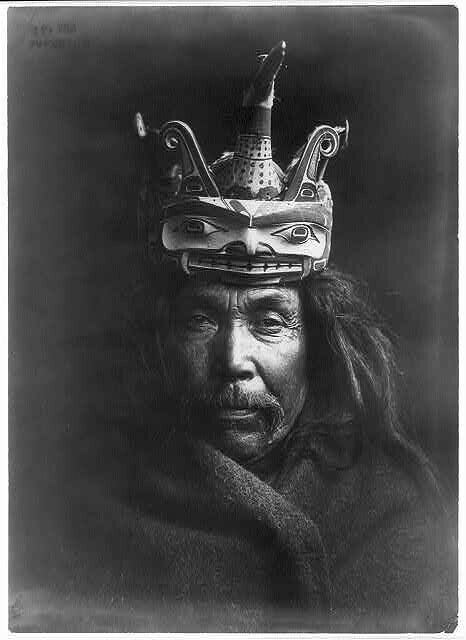 Nuhlimahla, Qagyuhl — Person wearing ceremonial mask of the Nuhlimahla during the during the Winter Dance ceremony. These characters impersonated fools and were noted for their devotion to filth and disorder. Mask of the octopus hunter, Qagyuhl — Ceremonial mask worn by a dancer portraying the hunter in Bella Bella mythology who killed the giant man-eating octopus. The dance was performed during Tluwulahu, a four day ceremony prior to the Winter Dance. 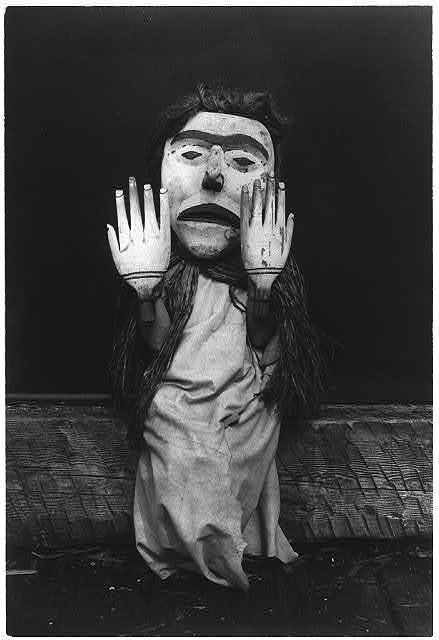 Nuhlimkilaka, Koskimo — Kwakiutl person wearing an oversize mask and hands representing a forest spirit, Nuhlimkilaka, (“bringer of confusion”). 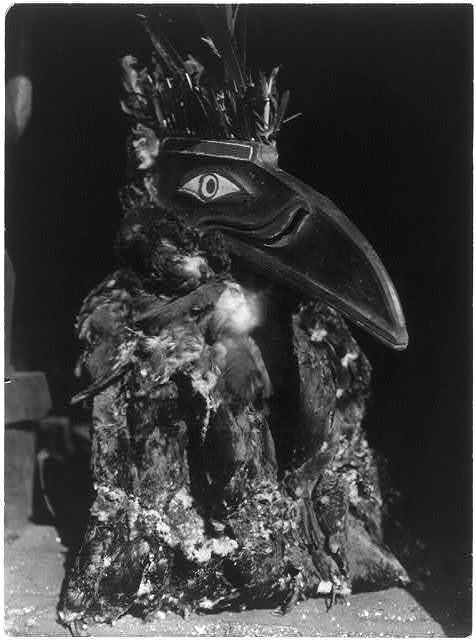 Kwahwumhl, Koskimo — Dancer wearing raven mask with coat of cormorant skins during the numhlin ceremony. 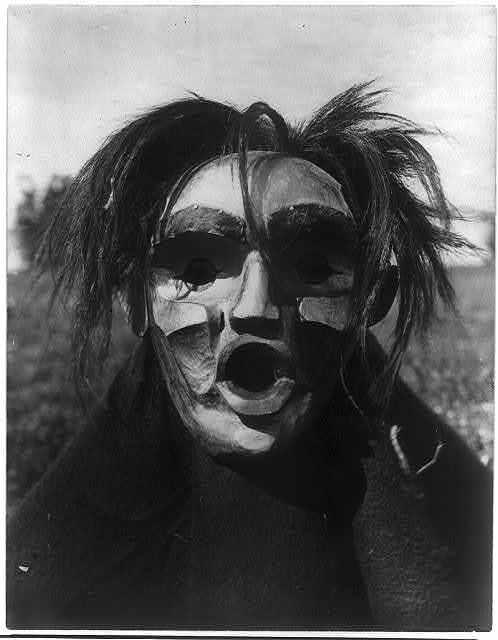 Pgwis, Qagyuhl — Kwakiutl person wearing mask of mythical creature Pgwis (man of the sea). 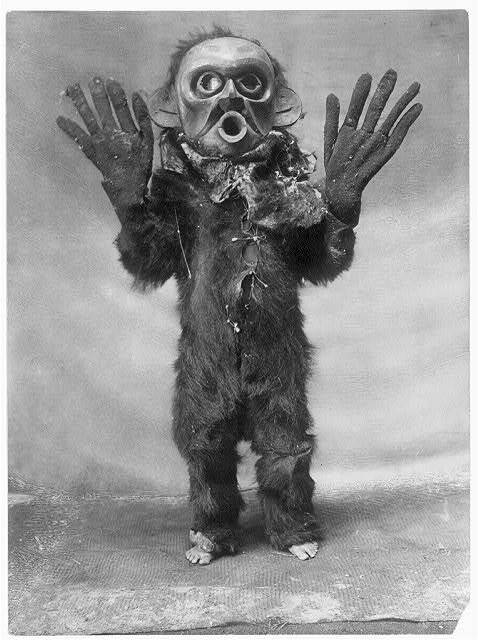 Atlumhl, Koskimo — Koskimo man in costume with ceremonial mask, on hands and knees. 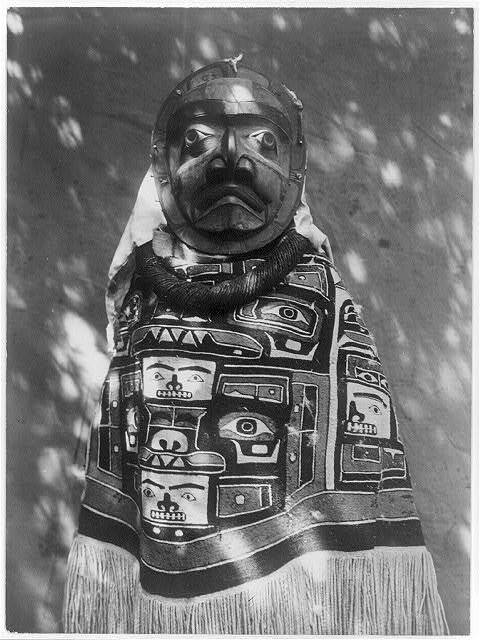 A Tluwulahu costume, Qagyuhl — Woman wearing a fringed Chilkat blanket, a hamatsa neckring and mask representing deceased relative who had been a shaman. 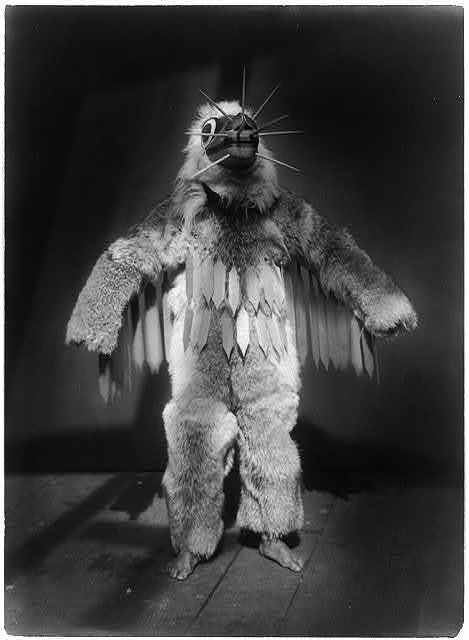 Hamasilahl, Qagyuhl — Ceremonial dancer, full-length portrait, standing, wearing mask and a fur garments during the Winter Dance ceremony. 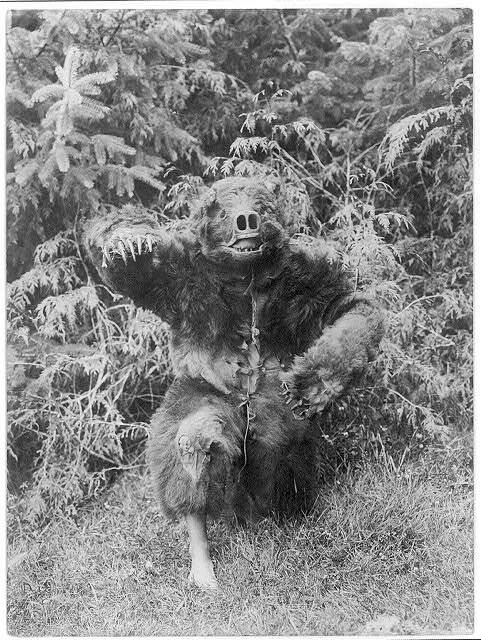 Nane, Qagyuhl — Man dressed in a full-body bear costume. The bear had the duty of guarding the dance house. 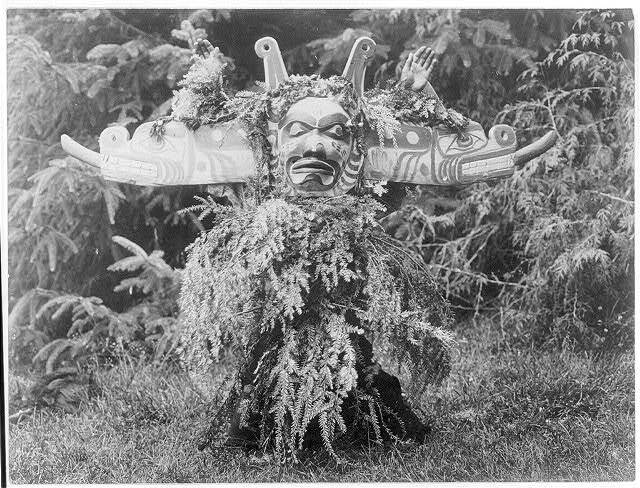 Sisiutl, Qagyuhl — Sisiutl, one of the main dancers in the Winter Dance ceremonies, wearing a double-headed serpent mask and shirt made of hemlock boughs. 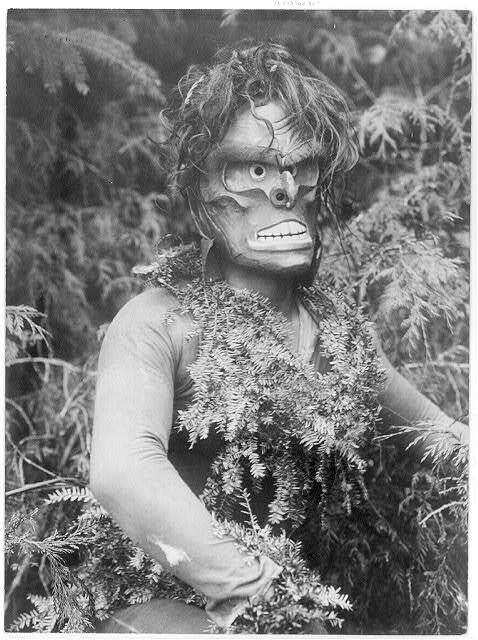 Paqusilahl, Qagyuhl — Dancer representing Paqusilahl (“man of the ground embodiment”), wearing a mask and shirt covered with hemlock boughs, representing paqus, a wild man of the woods. 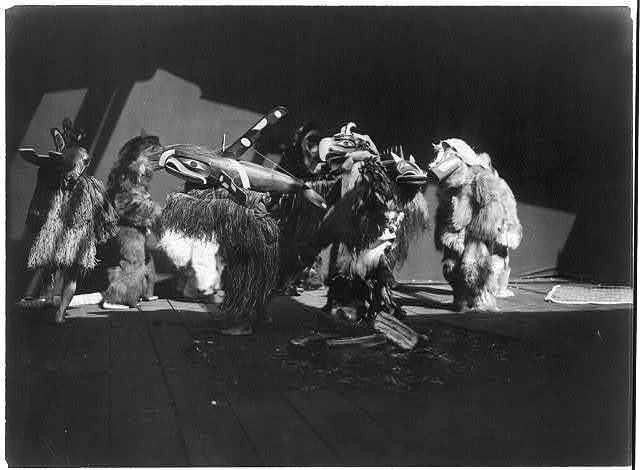 Group of Winter Dancers, Qagyuhl — Ceremonial dancers, in a circle during the Winter Dance ceremony, wearing masks and garments of fur, feathers, and other materials. 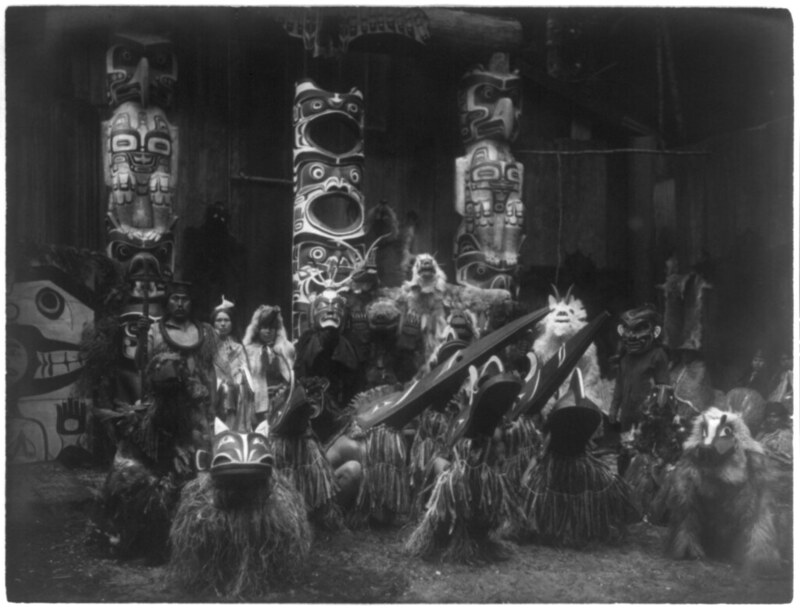 Masked dancers, Qagyuhl — During the winter ceremony, Kwakiutl dancers wearing masks and costumes, crouch in foreground with others behind them. The chief on the far left holds a speaker’s staff. Three totem poles in background. A Tluwulahu mask, Tsawatenok — Kwakiutl man, head-and-shoulders portrait, facing front, wearing a mask depicting a loon on top of a man’s head to facilitate the loon changing into the form of a man.